Any Video Converter Free for Mac is a free tool which can convert movies to AVI, FLV, MPG, MP4, 3GP, etc. , download online videos from YouTube, Nico Video, etc. , and edit movies and create files for portable devices including IPad , iPhone, iPad, Samsung smart phones, etc. Any Video Converter Free for Mac is a free video converter. The videos can be converted with this program in AVI, WMV, MP4, MPEG, FLV, 3GP, MP3 or other formats. Open convert video tab to use video conversion function. Click Add Files to add desired video files. 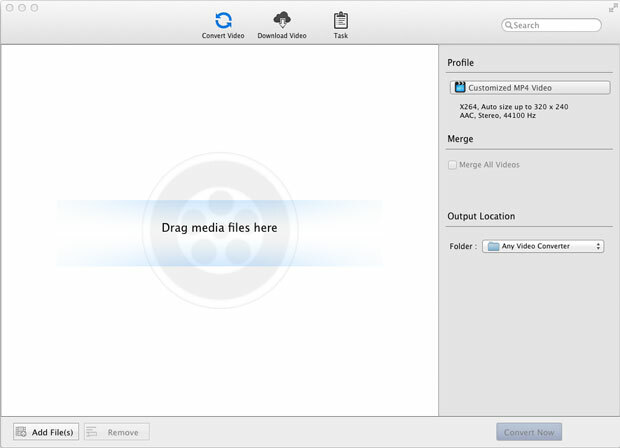 The drag and drop function is also supported when adding files. After adding the files, you can select your desired output format from Profile. You can convert your favorite video to common output formats for iPhone, iPad, Apple TV, Samsung smartphones, etc. .
Any Video Converter Free for Mac allows you to personalize your output format by clicking on the icon next to the output format option to set video and audio settings including Video codec, video frame rate, video bit rate, etc. .
Now click on the option Convert Now to start conversion. Any Video Converter Free for Mac is also a video editor. With this program, you can cut and merge files, add effects, etc. Click on the icon next to the video file, then in the pop-up window, you can set start and stop time of the clip. Click on the icon next to the video file, to open the following window. Effect: Under the Effect tab，you can add desired effect, adjust brightness, contrast and saturation. Crop: Under the Crop tab, you can remove unwanted part of the video. Watermark: you can add text and image watermark. As a free video downloader, it allows you to download online videos from YouTube and other video portals. Open Download Video window, click Add URL to download desired online videos. It’s a amazing program. I have used for one year. And every time it works perfectly to convert my videos. The custom service is also very patient for my any question. Any Video Converter for Mac is worth buying.